Piles Of Golden Coins Exchange PowerPoint Templates And PowerPoint Themes 0912-"Microsoft Powerpoint Templates and Background with piles of golden coins"-"Piles of golden coins, money, finance, business, success, signs" Soak in the luxury our Piles Of Golden Coins Exchange PowerPoint Templates And PowerPoint Themes 0912 provide. They offer top class and exclusive service. 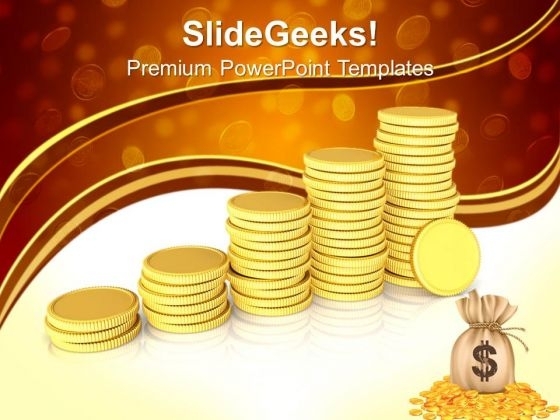 Enhance audience awareness with our Piles Of Golden Coins Exchange PowerPoint Templates And PowerPoint Themes 0912. They will keep them abreast of events.